Did you have any problems crossing an age milestone? There have been so many memories in my twenties, and I am sad to say goodbye to this decade, but I look forward to what is to come in the next ten years. And I'm excited to celebrate this big day with YOU!! 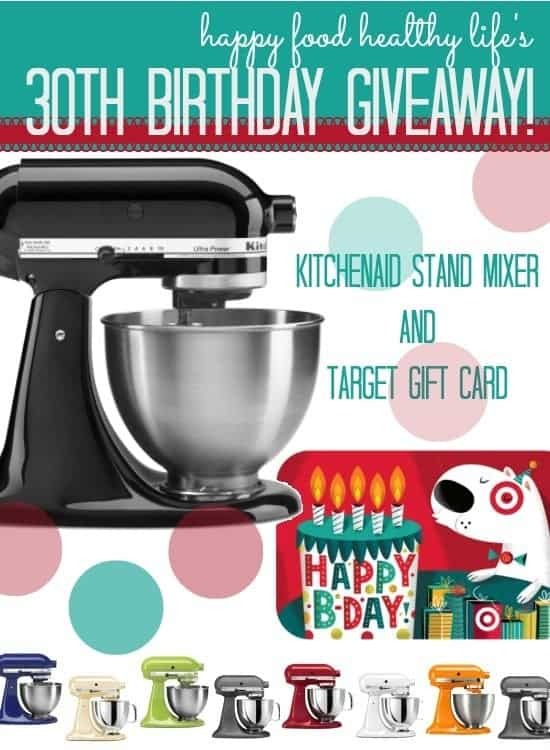 This little corner of the internet wouldn't be here without YOU all, and because of that, I'm going to celebrate by giving one lucky reader a 5-Quart Kitchenaid and a $100 Target gift card. Honestly, I couldn't live without my 5-quart KitchenAid Mixer, and I know many of my friends who feel the same way. Whether it's to whip up a batch of cookies, knead my favorite pizza dough, or ensure that my arm doesn't fall off when whipping egg whites for what seems like a billion minutes. My KitchenAid makes everything easier! I'm so thrilled to be giving one of you a KitchenAid of your own. And you get to pick the color (of the colors shown above). I got the red mixer after I got married, but which I had one of every color to suit my mood! And the Target gift card... I don't think any explanation is necessary here. Everyone loves Target and ends up wishing they had more Target-bucks to spend when they just went in for laundry detergent and came out with a cart full of $1 items, cute shoes, and holiday decor. Let me help you out with that! Actually, I've got a few friends that are going to help you out! I have some awesomely supportive blogging friends who wanted to join in the fun and help me celebrate my big thirtieth. About 30 of us are getting together to bring you these awesome prizes for my birthday. I'm all about letting you win on my birthday.... seriously, let's take the focus and attention off of me and divert it to you as a potential new KitchenAid owner! Pretty please go visit all of my friends pages and show them the support they deserve! Heck, they are as big of a part of this giveaway as I am! I couldn't have done any of this without them. Many of them have gotten me through this last week, as rough as it's been, and literally made this giveaway possible. Without many wonderful blogging friends, I may just be slumped in a big pile of sadness on my 30th birthday. So thank you. To my blogging friends. To you all. Thanks for making my birthday possible. Thank you for celebrating Thirty with me! ENJOY AND ENTER, THIS IS A GREAT PRIZE! !